Product #20647 | SKU CBT-500 | 0.0 (no ratings yet) Thanks for your rating! Every audio professional knows what it's like to have a dead cable. 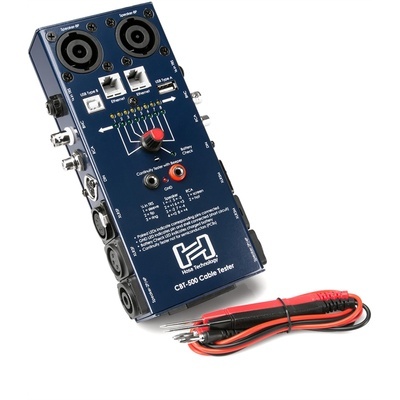 The CBT-500 Audio Cable Tester by Hosa Technology takes the guesswork out of the frustrating and time-consuming troubleshooting process. It tests all the most common audio cables including XLR, Phone, Phono, speakON, DIN, Ethernet and USB - confirming the working or non-working status of each. But that's not all, the CBT-500 also includes two removable leads to verify continuity of additional connectors and comes equipped with a 9 volt battery to get you up and running right out of the box.